St. Gregory Palamas, one of the pillars of Orthodoxy, was born in 1296, probably to a noble Anatolian family in Constantinople. He and his brother went to Mount Athos in around 1318, and lived in Vatopedi and Esphigmenou Monasteries. Gregory also successfully persuaded his widowed mother, brothers and sisters to become take up the monastic life. With the encroachment of the Turks, he was forced to flee to Thessalonica, being ordained a priest there in 1326. Afterward, he took up the eremetic life at a mountain near Beroea, and eventually returned to Athos in 1331. St. Gregory lived in very difficult times, for many heresies were creeping into the Church, and the Ottoman Empire was ever expanding, taking over Byzantine lands. In the early 1300’s he wrote on the nature of the Holy Spirit, showing the errors of the Latin view while living at the hermitage of Saint Savvas on Mount Athos. He became known as a preeminent theologian early in life, due to his many writings and for his beliefs on hesychasm. St. Gregory is known as one of the great defenders of Orthodoxy and is most well known for his defense against the heresies of Barlaam. Gregory was asked to defend the monastic ways of the Holy Mountain from the charges of Barlaam, a monk of Calabria. Barlaam, influenced by the Latin church, believed that philosophy and human thought were the way to know God. He stated the unknowability of God in an extreme form, having been influenced by a reductionist interpretation of the writings of St. Dionysius the Areopagite. Orthodoxy had always known, through the wisdom of the Holy Fathers, that prayer and fasting are the key to knowing God. Barlaam believed that the monks of Mount Athos were wasting their time in their prayers and fasting when they should be studying the great philosophers of mankind. St. Gregory said that the Holy Fathers and the prophets had a greater knowledge of God, because they had actually seen or heard God Himself. He taught that modern ideas about human thought and reason had no place in the Church. When asked how it is possible to have knowledge of the unknowable God, he showed the difference between knowing God in His essence or person and knowing God in his energies or being. It became clear that one could not find God in the logic of this world. He taught the Orthodox knowledge that it remains impossible to know God in His essence or person. However, with sufficient prayer and fasting and turning oneself over to God, through purification of one's soul, anyone can come to know Him in His energies and being. The Barlaam heresies spanned many years and two phases. Due to acts of political power struggles in Constantinople, Gregory was imprisoned to prevent him from speaking the Truth. As the political struggle increased, his accusers multiplied because he would not yield to their heresies, and he opposed the new emperor due to the emperor's acceptance of the heresies. When St. Gregory criticized Barlaam's rationalism, Barlaam replied with a vicious attack on the hesychastic life of the Athonite monks. Gregory's rebuttal was the Triads in defense of the Holy Hesychasts (c. 1338), a brilliant work whose teaching was affirmed by his fellow Hagiorites, who met together in a council during 1340-1341, issuing a statement known as the Hagioritic Tome, which supported Gregory's theology. 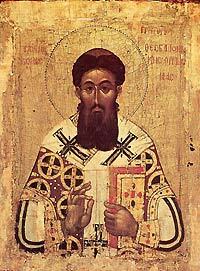 A synod held in Constantinople in 1341 also supported St. Gregory's views, condemning Barlaam. Later, in 1344, the opponents of hesychasm secured a condemnation for heresy and excommunication for Gregory, but the saint's theology was reaffirmed at two further synods held in Constantinople in 1347 and 1351. Collectively, these three synods in Constantinople are held by many Orthodox Christians and several prominent theologians to constitute the Ninth Ecumenical Council. Between the latter two synods, Gregory composed the One Hundred and Fifty Chapters, a concise exposition of his theology. In 1347, he was consecrated Archbishop of Thessalonica, but the political climate made it impossible for him to take up his see until 1350. During a voyage to the Imperial capital, he was captured by the Turks and held in captivity for over a year. He reposed in 1359, and was glorified by the Orthodox Church in 1368. The second Sunday of the Great Fast is called the Sunday of Gregory Palamas in all Orthodox Churches. A full service was composed for his feast day, November 14/27, by the Patriarch Philotheus in 1368. St. Gregory’s holy relics are kept in the Cathedral of Thessalonica. These dogmatic questions were not abstract or removed from the life of the Church. They should not be removed from us, either. It is wrong to look at them as simple theological or scholarly discussions that have no relation to our life. That would mean only one thing: that the light about which God speaks to us—the light in which there is no darkness—will remain unseen to us, and we do not regret or repent that we remain in darkness. All the problems in the Church are, in the final analysis, bound up with the fact that certain mysteries of faith become abstract. They cease to be living, essential questions that decide our fate; and we lose the depth of faith, and the fullness of our Christian calling, which we should be realizing in the Church.